Leaves - This is officially my first fall living in a city where the leaves really turn. 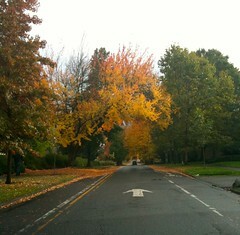 The bay area had a few trees and some color changes, but not quite like here. I'm seeing all the fall color spectrum - red, orange, yellow, etc. It's really beautiful! I've taken a few pictures and posting on Flickr, not really capturing the true feeling, but perhaps a glimpse. Flavors - Or should I say the yummiest time of year! I love pumpkins, apples, pears, ginger, sweet potatoes, and squashes (to name only a few). In fact, I have dilemmas. I just don't know what recipes to cook next. I really enjoy pumpkin recipes but there is so much out there. It's driving me nuts. I can only cook/bake so much (not to mention, it does cost to buy ingredients). Do I go with the tried & true or attempt something new that could be potentially fabulous?? I have to choose my recipes wisely. If only more money and more time. Yesterday I made some pumpkin muffins (a new Ellie recipes). You saw the apples last week in Josh's b-day dessert (a tried & true recipe). I want to make cookies, pies, risottos, mashes, crisps/crumbles (whoops drooling there, j/k). All I have left to say is, YUM! Weather/Air - Nature again (see leaves above). The air is just so crisp and fresh and then you get a whiff of fireplaces or something cooking. Deep breathe, close your eyes = happiness. And it's not yet too chilly outside (nor rainy yet - but we are getting some rain). Candles - I feel like I can light up my candles in the cooler weather and so another thing I love about the fall (this applies to winter and early spring too though). I especially love candles with spice smell like pumpkin (big surprise there), cinnamon, and such. Right now I'm burning a Yankee Candle Spiced Pumpkin candle...ahh so nice. TV Show - This is bad, but yes the TV shows are so great in the fall. If I allowed myself I would be plopped down at the TV for hours on end. I'm enjoying all my fall favorite shows like House, Greys, Fringe (a new fav), Glee (a really new fav), SYTYCD and more.